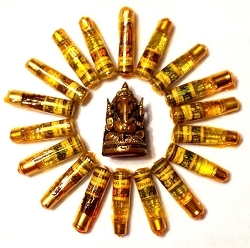 BEADSCAPE BRAND OM PURE ESSENTIAL BODY OILS - A Beadscape Exclusive! Home> Body Oils > BEADSCAPE BRAND OM PURE ESSENTIAL BODY OILS - A Beadscape Exclusive! These PURE ESSENTIAL BODY OILS - a great quality, highly concentrated non-alcoholic and long lasting oil are made exclusively for Beadscape! They come in a generous 1/2 fl oz bottle. 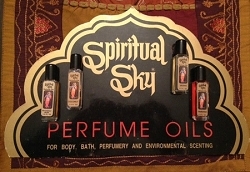 These oils are made from elements of essential oil and perfume oil. 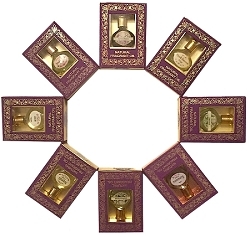 These high quality perfume oils are safe for use on your skin. They may also be used as scenting oils. The oils used are extracted from flowers, leaves, plant roots and wood. The oils are so pure, you may dab small amounts on your body (such as behind your ear lobes), add it to your favorite massage oil or simply rub some oil onto your hands and wipe over your clothes, bed linen, carpet curtains or even your car seats. 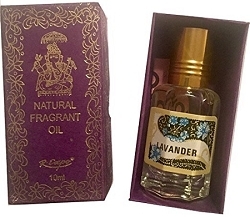 This oil may also be used for aroma therapy or environmental scenting. 1/2 fl. oz. bottle. The bottle measures 2 3/4" x 15/16" including cap. An essential oil is a liquid that is generally distilled (most frequently by steam or water) from the leaves, stems, flowers, bark, roots, or other elements of a plant. Essential oils, contrary to the use of the word "oil" are not really oily-feeling at all. Most essential oils are clear, but some oils such as patchouli, orange and lemongrass are amber or yellow in color. This body oil is "essential" in the sense that it carries a distinctive scent, or essence, of the plant. Essential oils contain the true essence of the plant it was derived from. Essential oils are highly concentrated and a little goes a long way.